For each blog that posts about the PEDIGREE® Adoption Drive through September 19th, PEDIGREE® will donate a bag of their new Healthy Longevity Food for Dogs to shelters nationwide. It’s simple: Write a short blog and feed a dog! 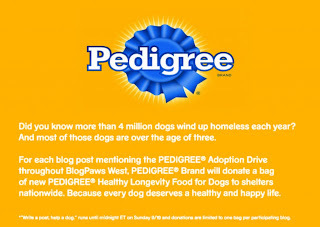 •Thursday, September 16 through Sunday, September 19, the Pedigree BlogPaws bloggers will host a Blog Hop, to help raise awareness for the “Write a post, help a dog” effort. Write a post and then go to LIFE WITH DOGS Thursday through, Sunday, 9/19 to leave a link to your post so Pedigree can find it and count it! It’s just that simple! All of us can take 5 minutes to write a post like this & you’ll know that a pup will go to bed with a full belly because of you! And a lovely weekend for you all! Like you we've been fortunate enough to have a good home since we were puppies, but we know we're lucky so we DO try to help pups who are not so fortunate whenever we can. Great post Oskar! You are a VERY good puppy!! Isn't this just the greatest thing? I'm just luving how everybuddy is coming together to helps doggies that don't have pawsome homes like we do! Thank you so much for taking the time to post about this event! With the help of everyone we were able to raise about 8,000lbs of food!